I was first introduced to Carole P. Roman in 2013 when we reviewed first 4 books available in the If You Were Me and Lived in . . . A Child's Introduction to Culture Around the World. We fell in love with them. I had the opportunity to review 3 more titles for The Old Schoolhouse Product Reviews and as a Crew Leader I've been adding to my collection. We love the Carole P. Roman books and collections so I want to share a few more titles from her culture series with you. These books are perfect when studying geography. 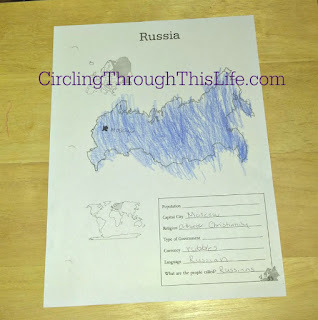 Geography is more than just learning where a country is on a map but also learning more about the people, customs, and culture of that country or region. Our geography lessons go in fits and spurts but these If You Were Me and Lived in . . . books are my go to spines. We study geography in spurts alternating with spurts of history and science. We do have a geography course that we are using and I chose If You Were Me and Lived in .. . China as that was one of the countries covered in our Year 1 course. I choose If You Were Me and Lived in . . . Russia because we have several Russian families at church and our church has a rich Slavonic history. I let Supergirl choose a third one and she choose If You Were Me and Lived in . . . Germany. She chose it because "I was born in Germany!" Each of these books follow a similar pattern. The first page is a map showing the country and the capital city. The next two page spread introduces the country and it's location in the world. Next you're introduced to the capital city. After learning a bit about the capital city you then learn about children's name and from this point you learn about the culture and people from the perspective of "if you were . . ." These books cover children's names, and what they call your parents. You'll learn about some of the places to visit and what kinds of toys and games children play. You'll learn about the currency and the book introduces you to the kinds of food you would eat. Each of the three we read for this review had information about an important cultural festival. The books also introduce children to the language of the country and thankfully includes pronunciation guides. I very much appreciate that these books have the pronunciation in right in the text as well as a pronunciation guide in the back. We started our geography spurt with Germany because it was the one that most excited Supergirl. With this book our tour guide is a little boy. The book is then told from perspective of if you were that little boy. "When your Tante and Onkel come to visit, your sister always wants to take them to see Neuschwanstein Castle." Later you read "you remind Papa you have to rush home to watch Fussball." When I read about how Tante was born in America Supergirl immediately piped up with "She was born in America but I was born in Germany!" She thought it amusing that the aunt was living in Germany but was born in America and she lives in America but was born in Germany. When we read about Fussball she declared that she preferred basketball over soccer and wanted to know if they have basketball in Germany. Germany is a little different from the other titles I've read in that it has a list of 5 facts about Germany. It presented as a report that the boy asks his father to help him with. 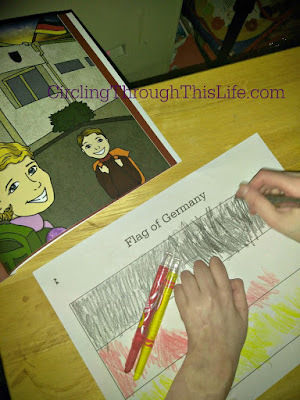 In addition to discussing the information presented in the books we colored a map of Germany and labeled a few cities and we colored a German Flag. One of my geography resources has a great summary page with a map so we filled that out as much as we could from just the book and added all those things to our Geography Notebook. Supergirl chose China to be next on mini-tour. She said she would not want to live in China. I couldn't get a clear reason why but I think it was because China has so many people. She said "because I am shy." I thought she would get super excited about the different types of food but she was more excited about the mentioning of basketball though she did tell me that she would be willing to try fried ice cream. One of things I noticed right away when reading this book is that it has lot more text per page then the German and Russian books. China is very large with different climates and the food is different depending on the region. I love that Ms Roman addressed that by talking about a dish or two from each major region. I recognized the dishes and the style from Mandarin to Cantonese as well as Szechuan and Shanghai. I love how she wove those all in using family. When you visit your cousins in the south, you would enjoy a Cantonese dinner with stir fried rice with sweet and sour pork. Grandma, who might live in the southwest, would cook in the Szexhuan style, which would be very spicy and include a lot of chili peppers. Yes reading that page made me very hungry and started a craving for some Chinese take-out. Supergirl was immediately asking "what's for dinner?" Russia did not give as much information about climate as China did but it did acknowledge the vastness of the country and pointed out that there are nine different time zones. We looked at photos on the internet of St. Basil's Cathedral and talked about how maybe Fr John visited it when we traveled to Moscow. She didn't recognize any of the Russian names though I know we have a Maxim. When we read about piroshky in the book I thought of the deep friend bread dough stuffed with ground beef, onions, and cheese. We get these at the State Fair. In my mind they are different from pierogies which are more like little dumplings. Piroshky is pronounced the same as pierogie. When we talked about how we always eat pierogies on Christmas Eve Samantha wanted to know if we could have them for Pascha. I didn't tell her that she could try caviar next week. It is a Slavic tradition to eat caviar on Lazarus Saturday which is the day before Palm Sunday. In case you ever want to know: the orange caviar is not so good. The black caviar? Much better. Different fish; different taste. Just sayin'. I think I'll be skipping the caviar this year. Day 1: Read the book. Take time with it. Pause and look at the pictures and discuss the book. Ms. Roman includes questions like "can you guess what do you think a wawa is?" or "Do you have a game like that too?" Day 3: Using the internet or other resources explore a topic from the book such as learn more about the Great Wall of China or try a food from the country. 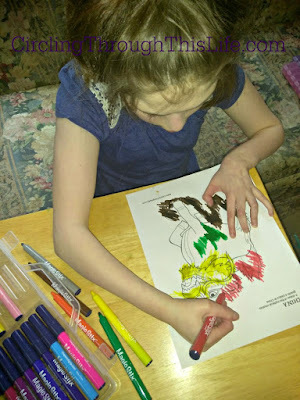 Day 4: Do a craft or coloring project or if you didn't do the flag do it here. Day 5: Read and enjoy the book again. These are fabulous, fun, and educational books. They can be simply enjoyed on their own and Supergirl loves to just look through them. 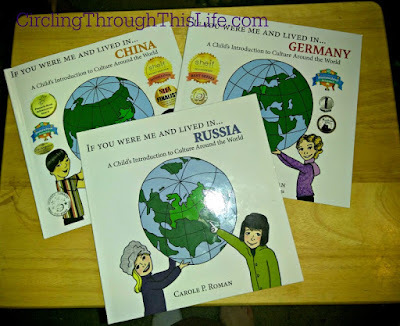 Another fun and educational series are the If You Were Me and Lived in . . . historical series. We'll be adding If You Were Me and Lived in . . . Colonial America to our American History Studies. We also enjoyed If You Were Me and Lived in . . . Renaissance Italy. Carole P. Roman has written many other books such as the Captain No Beard series, Bedtime Stories, and even a couple of beginning chapter books. 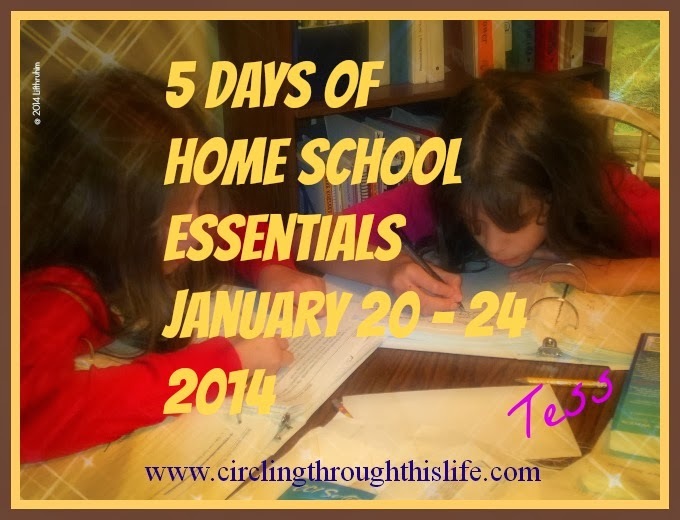 Be sure to visit the Homeschool Review Crew blog and scroll down to read more reviews! These books spur on such fun activities! Thanks for sharing. I am thinking about getting some of these to go with the kids language lessons ! Great Review ! We have really been enjoying the History books, I'm sure we'd love the Culture ones as well. Love seeing them.